WIFI Kit 8 is a cost-effective Internet of things development program , the main chip using ESP8266, with CP2014 USB to serial chip, lithium battery interface and charge and discharge circuit, 32M Byte Flash, WIFI antenna, 0.91-inch OLED display. It can be programmed in Arduino and NodeMCU environments. Note: This item comes unassembled, soldering of headers is required. Lithium battery is not included, battery may be purchased here: https://www.amazon.com/dp/B079M2W85C. Please feel free to email us if you have any questions or you would have a bulk order, how to email us? Click "MakerFocus" and "Ask a question". Looking for your consultation! 3.With 0.91 Inch 128*32 OLED Display, white, with WIFI, You will have an advanced and fun development environment! 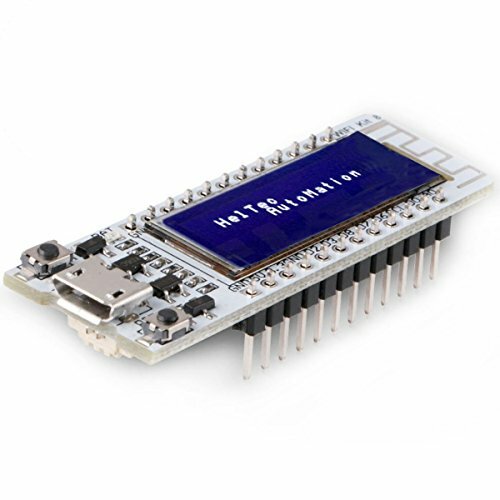 Main chips: esp8266 chip, cp2102 chip, leads all pins of ESP8266. Support Arduino and NodeMCU programing. To know more details of specifications, pls carefully view the images. 12 digital pins can be configured to read, write, IIC, SPI, the middle, PWM and other functions; 1 AD input, Working voltage: 3.3V 7V.